Unite and support winter bikers on the journey towards physical fortitude and personal growth. Winter is coming. And with it, the motorcycles that are being left in the garage, batteries taken off them, covers pulled over the shiny headlights. We have wrapped ourselves in comfort, in ease and in fluffy sweaters. We have made our lives cushy and safe. It's all too easy to become afraid of discomfort when you shield yourself from it. It's just so easy to layer on the defenses and curl up into a shivering ball, not leaving the house. But it's time to stand tall, take a big breath and face our fears. Get comfortable being uncomfortable. Get comfortable being cold, in pain and hungry. Get comfortable in chasing down your fears, until they become your powers. Where in the past we feared and avoided the cold, we have now turned the ability to withstand it into our superpower. Taking back the control of our bodies and minds, pushing out into the unknown, in search of the best versions of ourselves. We are the winter bikers, and this is #winterbikerchallenge. To promote personal growth and physical fortitude through winter motorcycle riding. Motorcycling is a very empowering activity in it's own right, but we believe that this energy can be also channelled to becoming better humans, and living up to our potential. Riding a motorcycle is not an easy feat, but even more so during winter, when the weather turns cold and the days become shorter. These conditions allow us to test ourselves, see how far can we go out of our comfort zone. Inspired by such people as Wim Hof, we aim to put our bodies and minds to the test and discover how we can achieve our full potential. As humans, we are programmed to grow through extreme discomfort, we are built to overcome challenges. In the preparation for the challenge, we aim to get comfortable with the idea of being in the cold, both mentally and physically, and leave the fear behind. During the challenge, we aim to thrive in the cold conditions and reap the benefits of controlled cold exposure and the mental clarity that follows. The sense of accomplishment from completing the challenge and knowledge that you're capable of much more than you can imagine. Last Sunday before Christmas, and first Sunday after the winter solstice, is the official Winter Biker Challenge day. A chance to organize rides globally and locally to celebrate the winter bikers. 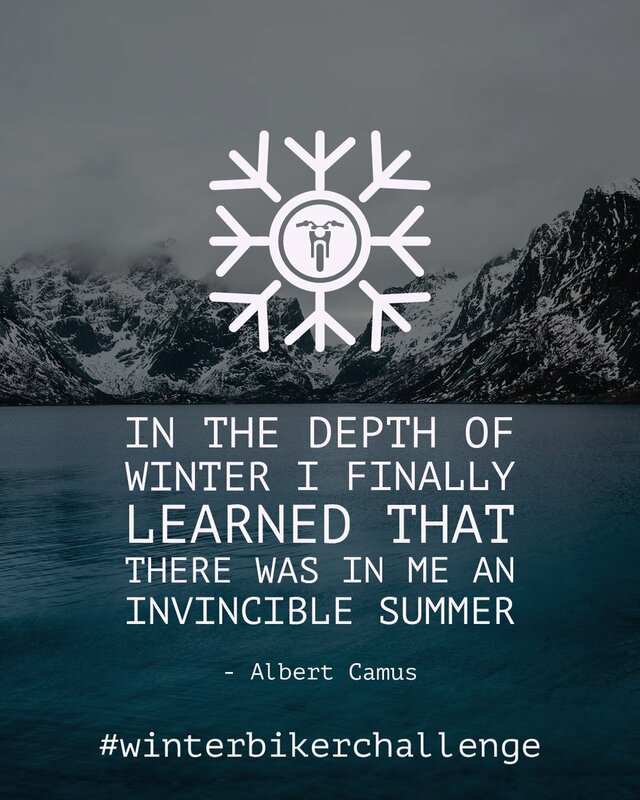 Goal: successfully ride through the 2018-2019 winter, the focus is on the month of December. We will promote the participant's posts on the @winterbikerchallenge Instagram account, where we will also offer information and guidance for motorcycle maintenance during winter, gear recommendations as well as physical preparation and conditioning for the cold. Start getting comfortable with the idea of cold exposure. Think it over, imagine being able to step into the cold without shivering and without fear. Begin physical preparation with controlled cold exposure (cold showers) and prime your body with the Wim Hof method. Continue your daily or weekend rides, as long as it's safe, beware of ice on the ground. Document your progress and your thoughts with the #winterbikerchallenge hashtag and share them with the community. 5. Ride with us (locally and globally) on Dec 23rd and share the ride on social media. I’ll only send you super interesting stuff, I promise.